The Etisalat Pan-African Prize for Innovation is awarded in two categories; the most innovative product/service and most innovative idea. The winner of the most innovative product/service will win an amazing cash prize of $25,000 while the winner of the most innovative idea will get a whopping $10,000 cash prize. Shortlisted candidates for the prize will be taken on an all expenses paid trip to Cape Town in South Africa to attend the 17th Annual AfricaCom Conference and awards gala dinner in November where the winners will be announced. It’s not too late guys! The deadline for the submission of entries is Thursday, August7th. Don’t miss out on your opportunity to be the next Pan African innovator! 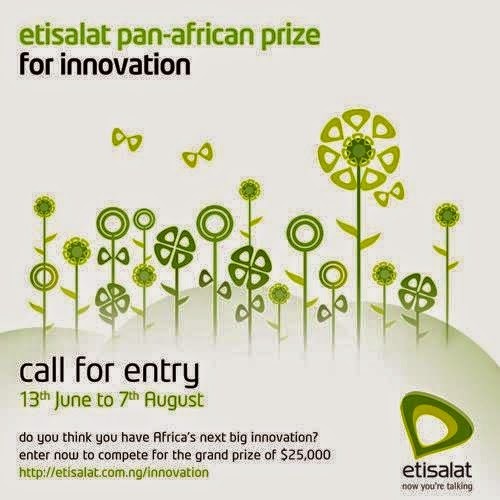 To submit your entries, simply log on to http://www.etisalat.com.ng/innovation/ to submit your entries today.